I believe we are here for a purpose; it’s not an accident we were born when we were, where we were, or who our parents are. We are born with purpose in our heart, completely connected to God, unfortunately over time the world gets in the way and we forget, we lose that connection to Divine! The hope is we eventually get back to our purpose….and begin to live our life the way it was always intended to be lived! 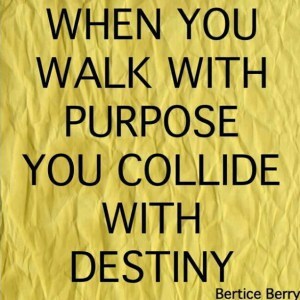 Better than just live our purpose – we collide with destiny!